This book was published last year to loud acclaim, but this week it came out in paperback. It’s a densely packed book; it is historical fiction reminiscent of such great literature as Uncle Tom’s Cabin and Huckleberry Finn, and yet a book that feels contemporary in writing style. 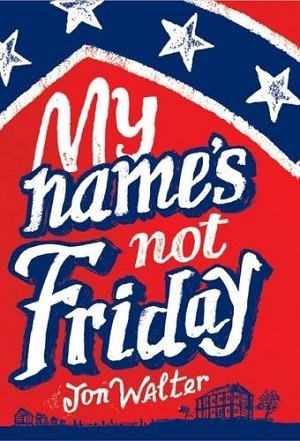 My Name’s Not Friday transports the reader to a different time and place; is immersive and evocative, rich and powerful. Thirteen-year-old Samuel is being educated by a priest in an orphanage for “coloured” boys. When he takes the blame for something he didn’t do, his punishment is to be sold into slavery on a cotton plantation in Mississippi, and he must fight to save his name, his identity, his faith in humanity and his faith in God. The reader is immersed straight into Samuel’s story – striving with him to understand why he can’t see anything, but can only feel his way through the darkness, believing that he has been taken by God. As Samuel holds onto his faith despite the turmoil through which he lives, all the way through to the end scenes in the dawning of a new age at the end of the American civil war, the reader remains captivated by Samuel’s voice. Walter writes as if he was divinely inspired himself – the story is narrated in the first person and Samuel is utterly convincing from the first line, utterly compelling, and one of the most memorable and likeable characters in contemporary children’s fiction. He displays infallible courage, yet continually questions himself in the eyes of God; is he acting morally? Is he fulfilling his duty? Samuel’s goal is to be reunited with his younger brother, Joshua, who has been left behind at the orphanage, but first Samuel must make his way as a slave. The community of characters with whom he lives and works are sketched with uncompromising and loving detail by Walter, from the plantation owner and her son, Gerald, with whom Samuel has a testing relationship, to the other slaves whose trust, friendship and love he gains. It’s something to remember characters in such detail and hold them with such fond regard months after finishing the book – even peripheral characters. Despite not setting out to write a historical novel – Walter explains in the acknowledgements that he wrote the first passages as a creative writing exercise about not having the sense of sight – the backdrop of the American civil war and the plantations at that time are sensually depicted, so that it’s hard to look up from the book and realise you are still in London, England. From the feel of the cotton plant to the sound of the Mississippi – it all feels real. The novel flows like a river with its fluid action, and yet there are deeper meanings and messages borne out too. The parallels with Defoe’s Crusoe are a clear intent – Walter mentions the book in his text – Crusoe’s naming of the man Friday and his subsequent quest to teach him Christianity are a key influence, but there are many other facets that surface. Samuel’s dislike of his attributed slave name – Friday – recalls the struggle with identity and what a name means to a man, as so clearly described by Arthur Miller in The Crucible; and yet here the extra emphasis that goes along with identity is that of ownership. How much a man owns another one – how that relationship can be civil or friendly and the consequences of such loyalty and respect, or lack thereof, and the pride and self-worth of a person? The scene of Lizzie and her chickens will haunt many a reader. This all ties in to race and equality – and it’s interesting to look upon this with historical perspective – how each generation writes about slavery within the context of its own time too – Walter uses the ‘n’ word significantly less than Huck Finn for example. Religion plays a large part in the story, as Samuel has enormous faith – in fact the book opens with him believing that he has been taken from the orphanage by God rather than a slave trader. His relationship with God influences and inspires him in different ways – sometimes he uses it as an excuse for his actions, and it is interesting to see how Walter lets this play out. There is also an interesting view on gender – again seen historically, and yet so contemporary. The male plantation owner is away fighting in the war, so the master of the house is actually the mistress. Despite her cruelty towards her slaves at times, she is seen as a woman of strength, and also of extreme pride – most often mistreating her slaves to make a point to the men of the district. And Samuel, rather than seeking a mother figure to look after him, constantly seeks out male role models. The son of the plantation owner, Gerald, is equally fascinated with how he will appear to his father, and this dictates so many of his own decisions. Lastly, and a trope that reappears in so much contemporary children’s literature is the seed authors sow in showing the benefits and freedoms that reading can give. Literacy, it appears, can be as freeing as unlocking a chain. This is a thought-provoking, gripping story. Multi-layered and yet on the surface a simple story of a boy trying to get home to his brother. It was worth the hardback price – it’s a steal in paperback. Reader, I bought it twice. Age 12+. Buy your copy here.